Systec's Chain Transfer Device (CTD) is a safe and efficient method of moving loads onto and/or off of a conveyor line. Based on the application, through optional load controls, loads can enter or discharge the device. Within certain applications, the device can act as a one, two, three, or four way intersection. Can sit within the conveyor line at various locations. 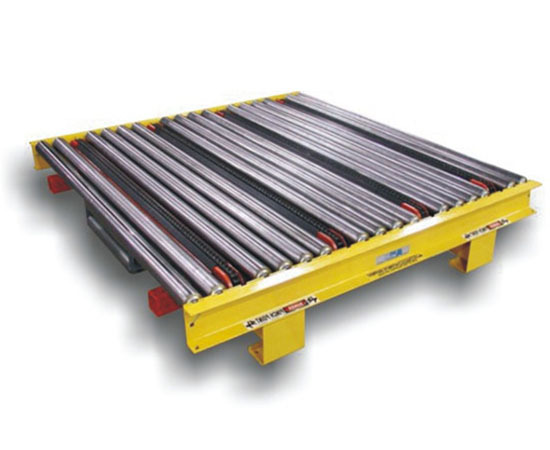 Can be moved to nearly any location within the length of the conveyor line. Totally independent of the conveyor in which it rests, and can be added to most other conveyor equipment manufacture's lines. Capable of being added to either Powered Accumulating Roller conveyor (PAR), Powered Roller Only conveyor (PRO) or Gravity Roller Conveyor (GRC). Chain bars are fully adjustable on a 3" increment to meet any changes in production or configuration requirements.